What the history of handwashing in hospitals tells us about ego and the kneejerk reflex to reject evidence. In 1846, Ignaz Philipp Semmelweis, a sad-eyed, mustachioed young medical graduate, became chief resident of obstetrics at the Vienna General Hospital. Over the next two decades of his brief career, he became the “savior of mothers” and an enemy of the medical establishment, driven mad by his quest for the truth about hospital-acquired infections. 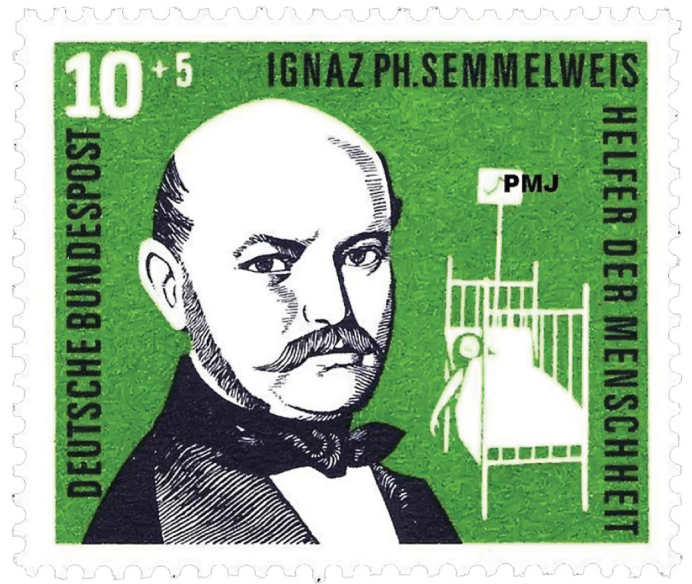 Semmelweis memorial stamp from Germany. Source: “Medicine in stamps-Ignaz Semmelweis and Puerperal Fever” by A.D. Ataman et al. To me, it appeared logical that patients who experienced street births would become ill at least as frequently as those who delivered in the clinic. What protected those who delivered outside the clinic from these destructive unknown endemic influences? I hoped the Venetian art treasures would revive my mind and spirit, which had been so seriously affected by my experiences in the maternity hospital. Day and night I was haunted by the image of [his] disease and was forced to recognize, ever more decisively, that the disease from which [he] died was identical to that from which so many maternity patients died. In these pre-Louis Pasteur days, the medical establishment didn’t yet know about bacteria. The main preoccupation of the time was with humours and miasmas, and ‘treatment’ for childbed fever involved inducing vomiting, bloodletting, blistering agents applied to the women’s inner thighs, enemas, and liberal use of leeches with the aim of purging the fever heat from the body. His friend’s death—so similar to the deaths in the medical student clinic—led Semmelweis to hypothesize that the trainee doctors were exposed to ‘cadaverous particles’ in the course of the autopsies they conducted, which they then transferred to the new mothers. The midwives in the neighboring clinic, who concerned themselves only with births, weren’t exposed to these cadaverous vapors. Semmelweis proposed, for the first time in medical history, a connection between touching cadavers and a risk of infection. Semmelweis decided to act on his hunch. He instituted a clinic-wide policy of mandatory hand washing between cutting up a body and assisting in a birth. “[Hospital staff] had frequent opportunity to contact cadavers. Ordinary washing with soap is not sufficient to remove all adhering cadaverous particles. This is proven by the cadaverous smell the hands retain,” Semmelweis wrote, introducing a chlorinated lime solution to the hospital. It removed the smell of death and would, hopefully, remove the particles too. In the first three months, death rates plummeted from one in ten to one in a hundred. 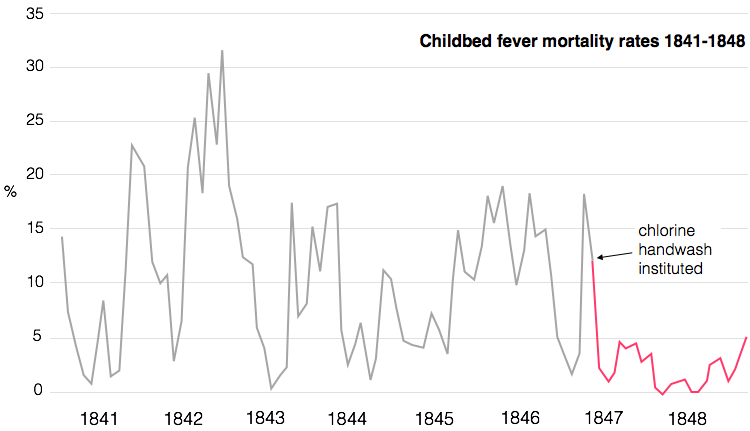 Semmelweis had shown that he could conquer childbed fever with handwashing. 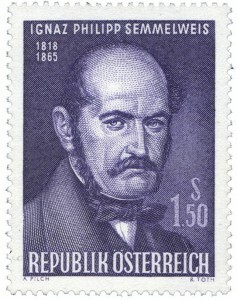 Semmelweis Memorial Stamp from Austria. Source: “Medicine in stamps-Ignaz Semmelweis and Puerperal Fever” by A.D. Ataman et al. Danish physician Carl Edvard Marius Levy wrote a vitriolic attack of Semmelweis’s findings. First, he deferred to the statistics, blaming the success of Semmelweis’s hypothesis on normal fluctuations of mortality rates in maternity clinics. Next, he argued against the assertion that anything so small as to be invisible could cause death, saying that, “With due respect for the cleanliness of the Viennese students, it seems improbable that enough infective matter or vapor could be secluded around the fingernails to kill a patient.” Lastly, he questioned Semmelweis’s methods altogether: why didn’t he run a simpler experiment, by fully separating those working with cadavers from those aiding in births? To be fair, Semmelweis did have major faults in his reasoning—he thought that only cadaverous particles caused the fever, and couldn’t explain why some women still contracted fever in the midwife clinic. But, perhaps most importantly, his theories presented a behavioral conundrum for his fellow physicians: testing his hypothesis further could implicate them as dealers of death. Accusing doctors of haplessly causing disease was a slur on the gentlemanly art of medical practice. Such resistance within the medical community was short-lived. In the later part of the 19th century, a rising tide of empiricism—in particular the work of Joseph Lister and Louis Pasteur—lifted the lonely little ship of hygiene, and the benefits of hand washing would become universally accepted. But while medical knowledge has radically shifted in the last 170 years, the reluctance to wash hands has persisted. The figures are striking. One large study found that hand washing rates were at just 26% in intensive care units, and 36% in the other wards (after monitoring systems were put in place, they jumped to about 50%). Another found doctors self-reported hand washing 73% o the time, but actually only did it 10% of the times they should have. The results are clear: doctors in hospitals not washing their hands kills roughly 100,000 Americans every year and sickens 1.7 million more. So after 150 years, why is this still a problem? Excuses from doctors range from being too busy, to the washing solution and alcohol rubs drying out their hands, to constantly having to carry equipment which makes it difficult to wash, to hand washing facilities being inconveniently located. Others simply say they forget. Today, a whole industry of high-tech ways to remind doctors to wash their hands has sprung up, selling hospitals vibrating sensors to remind doctors to lather up, intensive video-monitoring, and incentive schemes for good hygienic practices. One hospital introduced waist-high monitoring that buzzed when doctors walked past without washing their hands. But doctors got down on their knees and crawled under the sensors, just to avoid washing their hands. While busy doctors may occasionally be absent-minded, such reports seem to indicate that sometimes they knowingly avoid it. Doctors are pretty much universally regarded as empirically-minded. But knowledge doesn’t always translate to universal shifts in behavior—regardless of how easy, necessary, or cheap the solution. The clean, elegant answers produced by biomedical science can’t be found in equal measure in the dirty world of human actions and motivation. And what about our hero, Dr. Semmelweis? Increasingly obsessive over the years, Semmelweis took his colleagues’ reluctance to accept his theories as a personal affront. Rather than launch a charm offensive to win his fellow obstetricians over, he wrote them abusive public letters: “I declare before God that you are a murderer and [history] would not be too unfair if it remembers you as a medical Nero,” he told one. Increasingly driven mad by the world’s failure to appreciate the importance of hand washing, likely exacerbated by a a touch of syphilis or Alzheimer’s, his colleagues eventually had enough: three obstetricians signed referrals committing him to a mental asylum. One day, while on vacation with his wife and child, he was met at a train station by an old friend who wanted to show him his sanitarium. Under this pretext, the 47-year old Semmelweis was driven straight to a large, public asylum. He was severely beaten by the guards and died—of an infection—two weeks later. In honor of Semmelweis’s legacy to medicine, several medical schools, hospitals, womens’ clinics, and museums now stand proudly bearing his name. But, perhaps most appropriately, his name graces the so-called “Semmelweis reflex”: the kneejerk reflex to reject new evidence contradicting established norms. Leah Ginnivan is a public policy researcher and campaigner with an appreciation for arcane Wikipedia. Twitter: @leahginnivan.